Edward Leedskalnin was born in Riga, Latvia on August 10th, 1887. When Ed was 26 years old, he became engaged to marry his one true love Agnes Scuffs. Agnes was ten years younger than Ed and he affectionately referred to her as his “Sweet Sixteen.” Agnes canceled the wedding just one day before the ceremony. Heartbroken and deeply saddened by this tragic loss, Ed set out on a lifelong quest to create a monument to his lost love that has become one of the world’s most remarkable accomplishments. From 1923 until his death in 1951, he built Coral Castle in Florida. He was about 5′ tall and 100lbs. The story goes he searched all over the area looking for land with the right combination of features. He found the right land and started cutting blocks of oolite limestone out of the ground. Some of these blocks weighed up to 30 tons. He worked alone and would never let anyone see him working. The only eyewitness sighting of him working include two teenagers who said the blocks seemed to float like helium balloons. Others saw the equipment he used which included a tripod of logs and rope to lift the blocks. It was said they didn’t think the logs or rope would be anywhere close to strong enough to lift the blocks. One thing was unusual about his setup. At the top of the tripod was a small black box which Leedskalnin claimed was a “perpetual motion holder”. In 1936, he decided to move everything to a new property. The story goes that he hired a truck to transport the blocks. They would leave the truck and return later. A short time later the blocks would be loaded, without any heavy equipment that they would normally require. Leedskalnin claimed to have figured out the secret of how the Great Pyramids were built and he used that technique. He died in 1951 without ever revealing how he did it. A final related story. He built a 9-ton revolving door that was so perfectly balanced that a small child could move it easily. In 1986 it stopped working because the bearings had rusted. It took 8 workers and a 50-ton crane to remove and reinstall it. It needed further work a decade later. They have never been able to get the door to move as easily as Leedskalnin did. How did he move all those big blocks by himself and with such precision? Knowing these secrets could save billions on construction and logistics. Edward Leedskalnin actually wrote a book with experiments and his attempt at explaining an effect with which he had some experience. He was very interested in electricity and magnetism. He ran experiments that included making what could best be described as a homemade Tesla coil capacitor (its configuration is not an A/C generator like some claim). This may have been able to make a magnetic field between two pieces of metal, in a small area, or across a larger area of hundreds of feet. This is still not clear. Some further info – Researching this subject is difficult at best. There are skeptics who have filled the internet with claims which are incomplete, inconsistent, and illogical. Some of these claims are just some random person who offers no evidence, except for their explanation and skepticism. There are many claims by people who think Ed simply used hard work and leverage to do all of this. 1100 tons of limestone cut, shaped, moved, and set in place over 30 years is not that much. While some of the pieces would be difficult to move, it would be possible with the right equipment of that time period. But he didn’t actually do it over 30 years. Best evidence is that 900 tons of it was done in just a few years after moving to the Homestead, Florida location. Considering the time to cut and shape the stones he probably had a few hours to move and erect each one. Orval Irwin’s claim in his 1996 book that he was a friend of Ed’s and helped him move all of his tools to the new location. This was when Orval was in his 80s, 45 years after the death of Leedskalnin. I can’t find any evidence, other than Orval’s claim that he was any particular friend of Ed’s or that he even knew him. But if his claim of being hired to help Ed move all of his tools is true, then there is a problem. 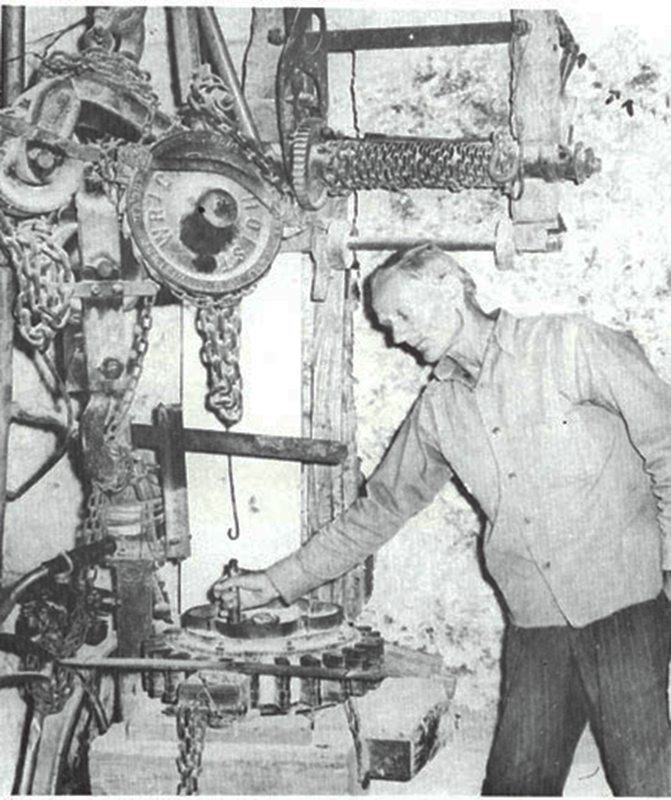 After Orval helped Ed move all of his tools, he had to hire Bob Biggers, with a bigger truck, to move the blocks. Bob would leave his trailer and return after Ed loaded the blocks. Bob never saw how he did this. The closest he got was one time when he forgot something, returned after only 30 minutes and most of the blocks for that trip were loaded. Bob didn’t see any equipment that would be needed to load the blocks. That would make sense, since according to Orval all the tools had already been moved. The flywheel contraption in his workshop some claim was just a hand-cranked A/C generator. This may be even more interesting than the castle. He claimed to have made 10 of them, but the one at Coral Castle is the only one known of, isn’t complete, and there are no drawings of the complete design. First, if you look at the probable complete design of this machine, it is nothing like an A/C generator and could not be used for that purpose. The skeptics claim that he used it for lighting two light bulbs outside so he could work at night. Which doesn’t make any sense, since a hand-cranked generator stops making power when a person stops cranking. There supposedly is an old production A/C motor there which could have been used with a gas motor and belt to power the lights and other electrical equipment, which was common at that time. What Ed built is something else. Add in the metal pipe next to it which goes deep into the ground, the same type of pipes sunk deep into the ground around the property, the high water table in that area, the high mineral content of that water, and the metal soled shoes he had. Sounds to me like he was experimenting with magnetic fields. He wrote some books on the subject of magnetism and electricity. He was experimenting. He had a visit from the Air Force because he was disturbing their communications. I don’t believe the Air Force would actually believe that all the wire he had strung around was for a radio antenna. Radios are receivers, not transmitters and couldn’t disrupt communications. It would seem that Coral Castle was not an end to itself. It was part of the experiments he was running. He was a very intelligent man, even though he was not classically educated. He was an avid reader. He claimed he used the same visualization techniques as Einstein used to develop his greatest works. He may have applied for a patent at one time, but the patent office won’t even consider something that resembles a perpetual motion machine. Looking at some of the features of the Coral Castle, he was into astronomical alignments and ancient geometries. He had a theory of the structure of the atom which is closer to what most scientists now believe is the structure of the atom than what Neils Bohr came up with. The star in the middle of the fountain (he wasn’t Jewish) is a 2D-view of two tetrahedrons, one inverted. The videos of Ed moving blocks with a chain hoist and jack with rollers. Of course he used these traditional tools. He came from a family of stone masons. That doesn’t mean those were his only tools and techniques. The few videos and pictures are ones that seem to be preplanned and for which he posed. The video of the jack and rollers is of a very small stone and would probably be easiest to move that way. Not so for the largest stones. And if you look at the condition of those stones, he would have had a significant amount of cutting once the block was to the location he wanted it. The chains are cutting into the corners of the blocks badly. None of the placed stones show these marks. Conclusion – So did Edward Leedskalnin just use hard work and leverage to build Rock Gate Park (Coral Castle) or is there some evidence that he was experimenting with something more advanced? He does not appear to be just another stone sculptor, but someone who study some advanced subjects. He could have figured out a form of mag-lev technology or something we still may not fathom. Or he could have just used leverage and hard work. That would still be a lost technology. But I’m still waiting to see a skeptic using only a chain hoist, some logs, a jack, and rollers move and erect a 30-ton, 40 feet long obelisk of delicate limestone, without chain marks, then take it down, load/unload it on a truck and erect it again without chain marks. I’ll still remain undecided until then.